(NaturalNews) Australia's vaccine zealots are the most rabid extremist wing of the vaccine medical mafia, and they've engaged in tactics like issuing death threats to vaccine educators to try to silence them. Now, they're trying to get the Australian government to ban the travel visa of Dr. Sherri Tenpenny, a pro-informed-consent educator who has conducted more research into vaccine adverse effects and safety risks than almost anyone else speaking out today. Click here to see the recent video news report on YouTube. Australia's vaccine mafia, it turns out, is absolutely terrified that citizens of Australia might learn the truth about vaccine exemptions, toxic vaccine ingredients (like mercury) and the growing global epidemic of vaccine-damaged children. So they're running a mafia-style censorship campaign to strong-arm speaking venues to cancel scheduled events where Dr. Tenpenny is scheduled to speak, and they're even petitioning the Australian government to revoke Dr. Tenpenny's travel visa, barring her from entering the country altogether. In the process of all this, they are turning Dr. Sherri Tenpenny in a folk hero and attracting enormous global attention to the unethical tactics and censorship gestapo tactics used by the vaccine industry to silence educators. The vaccine industry insists its immunization recommendations (and safety claims) are based on solid scientific evidence. Any science that's really "solid," however, would easily be able to withstand the scrutiny of independent questions, vaccine skeptics or non-conformist doctors who want to carry out a rational discussion about vaccine risks vs. supposed benefits. But when a so-called "science" is so terrified of the public hearing the other side of the argument, it's no science at all. It is a dogma. Any science that must actively seek to silence and intimidate those who might question its core tenants is a fraudulent pseudoscience. The scientific method, after all, is based on the idea that you gather all the available evidence and arrive at conclusions that follow from the evidence. But "vaccine science" -- which is actually an oxymoron like "military intelligence" -- will not dare consider any evidence that contradicts its present-day dogma. Propaganda, not science, is the basis of today's vaccine industry. The public is only supposed to hear, over and over again, statements and claims about vaccines which are demonstrably false: notably, that vaccines always work and are never dangerous. In reality, vaccines often don't work at all. And they're so dangerous that they routinely kill innocent people. Vaccines are also often based on deliberately falsified "scientific" evidence as described in detail by two former Merck virologists who filed a False Claims Act with the federal government, describing how the company spiked human blood samples with animal antibodies to fake the evidence "proving" their vaccines worked. Just recently, another vaccine killed at least 13 people in Italy, meaning vaccines in Italy killed more people than the recent terrorists in France. A few months before that, dozens of girls suffered severely debilitating health effects after receiving HPV vaccines, sending hundreds to the emergency rooms of local hospitals. In response to this, the vaccine mafia claimed a whopping 370 victims of HPV vaccines suffered from "mass hysteria" and were merely "imagining" their medical symptoms. Wow. WHO-approved vaccines given to young women in Africa have also been confirmed spiked with sterilization chemicals to secretly prevent conception. It's just one of the many examples of vaccines being used to covertly inject the population with chemicals secretly introduced into vaccines as part of the global human depopulation agenda now under way. Vaccine companies are also criminal enterprises, being routinely found guilty of serious felony crimes such as bribing doctors and paying kickbacks to hospitals. Even the U.S. Dept. of Justice -- which almost never goes after powerful corporations -- nailed GlaxoSmithKline with a multi-billion-dollar fine after charging the company with felony criminal misconduct. The truth is that both vaccine companies and vaccine propagandists operate as a criminal mafia, resorting to insidious, highly-unethical and borderline psychopathic tactics to try to silence anyone who dares question official vaccine propaganda. Those tactics include explicit, direct death threats, hack attempts of websites, ganging up on news organizations to blockade any news that questions vaccines, pressuring speaking venues to cancel events, and now even pressuring the government of a large nation to revoke the travel visa of a doctor who promotes vaccine education and informed consent. What are Australia's vaccine zealots so afraid of, really? Think about this logically. If Dr. Tenpenny's lecture was totally loony and nonsensical, the vaccine mafia should be happy to let her speak everywhere. If what she's saying is crazy, after all, then allowing her to speak to a massive audience would only convince more people to take more vaccines. But the only reason why they are so frantically trying to censor Dr. Tenpenny is because her lecture makes so much sense. The information she shares with the audience is groundbreaking, revolutionary knowledge that people everywhere need to know in order to make informed choices that impact their personal health. You may wonder: What kind of medical system wants to block doctors from teaching the public information that would help them make more informed choices? The answer is: A medical system that cares more about vaccine profits than public health. This is the same corrupt, criminal medical system that habitually lies to the public and claims vaccines are safe (they aren't) and effective, even when the CDC openly admitted this year's flu shot probably doesn't work because it's the wrong strain. The fact that children everywhere around the world are being harmed and even killed by vaccines doesn't concern the vaccine industry the least bit. In yet another example of blatant anti-science quackery, the entire industry selectively discards all evidence of vaccine injuries, pretending such injuries are not happening. It is precisely this sort of deliberate ignoring of important public safety evidence that's causing the vaccine industry to make a mockery of itself. It's also why more and more people are waking up and realizing the vaccine industry is a dangerous medical racket founded in pseudoscience quackery, depopulation agendas and the systematic chemical abuse of children. Much like the con artistry of Big Tobacco which once ruled medical journals and funded all "scientific" research into the claimed safety of cigarette smoking, the vaccine industry currently dominates messages that appear in medical journals and the mainstream media. 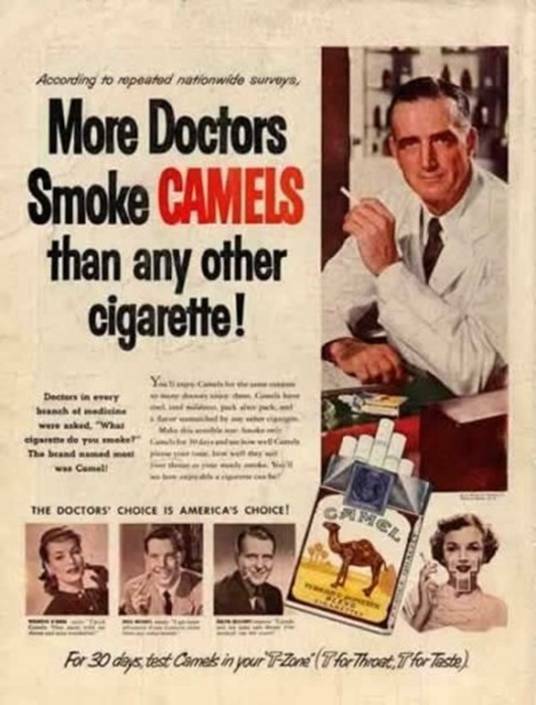 But this brand of corporate-quacked pseudoscience is no more legitimate than the Big Tobacco "science" which produced full-page ads for Camels cigarettes appearing in the Journal of the American Medical Association along with claims like, "More doctors smoke Camels than any other cigarette." In both cases, the corporate science was utterly contrived, and anyone who opposed the for-profit corporate machines that poisoned people for profit with their toxic products was silenced, fired, intimidated or otherwise threatened. Just as Big Tobacco's top executives swore under oath to the U.S. Congress in 1994 that "Nicotine is not addictive," today's vaccine pushers swear, "Vaccines do not cause autism." And yet even the CDC's own top scientist whistleblower openly admitted in 2014 to a massive CDC cover-up that sought to bury the data linking autism and vaccines. The mainstream media everywhere around the world, of course, completely censored that story and refused to report it. Not because it wasn't newsworthy -- it was actually one of the biggest medical stories of the decade -- but because they didn't want the public to hear any information that might shatter the false faith in the fragile illusion of vaccine safety. The vaccine delusion is so fragile, remember, that it could be shattered by a single truthful news story appearing in the mainstream media. And that's exactly why the mainstream media won't run a single truthful news story about vaccine links to autism or the fact that flu shots are still made with the toxic heavy metal mercury. Click here to read why flu shots are the greatest medical fraud in history. The only way to keep the scam running is to completely black out any honest information about vaccine adverse effects, chemical ingredients or vaccine history... such as the disturbing fact that as many as 98 million Americans were injected with simian cancer viruses as part of the nationwide polio vaccination programs in the 1960's and 70's. So censorship and illusion become the last desperate ploys invoked by an industry running on lies, smoke and mirrors. This is why the citizens of Australia can never be allowed to hear Dr. Sherri Tenpenny describe the meticulously researched scientific evidence that calls into question the safety of vaccines. In a medical system built on a house of lies, truth is the greatest threat of all. The vaccine industry is terrified of Dr. Tenpenny teaching informed choice in exactly the same way the Church was once terrified of Italian scientist Galileo saying that the sun is the center of our solar system. Finally, the very reason why you should always question vaccine safety is precisely because the vaccine industry can't be trusted to tell you both sides of the story. One hundred percent of the information the vaccine industry tells the public is distorted, shaped and engineered to mislead and misinform. It is only through courageous truth-tellers like Dr. Sherri Tenpenny that people are learning information from both sides of this issue so that they can make an informed decision.